A southern bread pudding using leftover bread and a can of fruit cocktail and finished with a drizzle of whiskey sauce. Ah, old fashioned bread pudding. A dessert born out of economics and the need to use up stale bread, turned into a delectable, delicious plate of total comfort. You cannot consume a slice of this and help but feel like you just got a big ole hug. And I just so happened to have a half a loaf of French bread leftover from this weekend! Lucky me. Oh. My. Goodness. Y'all. This is soooooo good. Before you scoff at the use of fruit cocktail in this recipe, I challenge you to give it a try first. I got the idea from a recipe shared by Paula Deen for Bill Nicholson's Krispy Kreme Bread Pudding. I even made my own version of glazed doughnut bread pudding! You can substitute other kinds of fruit, just be sure to drain it well and then just pulse it up a bit to crush it. I also happen to love this bread pudding with raisins and I prefer mine with golden raisins - some folks just leave them out all together. But... I do always like my bread pudding with a bit of Whiskey Sauce. It's just the perfect finish! Mine uses no eggs, so no worries with the raw egg thing. This doubles fantastic for a larger pan and what a southern favorite! Can I get a collective yum? Oh, and before you leave, pop over and check out my New Orleans Creole Style Bread Pudding. It's extra rich and decadent and it has meringue y'all! Go look and don't worry - I'll hold your place. Now, let's go make this bread pudding - here's how! For more of my favorite bread pudding recipes, visit my page on Pinterest! Preheat oven to 350 degrees F. Whisk together the milk and half and half. Tear the bread into small pieces and put into a large container for soaking. Pour the milk mixture all over the top. Let sit for about 10 minutes. Stir. In a separate bowl, whisk the eggs with the sugar and vanilla until well blended. Pulse the fruit in a food processor or blender to break it up, but don't puree it. Add the raisins and fruit cocktail to the egg mixture, pour over the bread and gently mix. Put the melted butter into the bottom of a 9 x 9 inch baking dish and coat the dish all along the sides and bottom. Spoon the bread pudding mixture into the dish. Bake uncovered at 350 degrees F for 1 hour, or until bubbly on the sides, golden brown and set in the middle. Let cool for about 5 minutes before cutting into squares. Drizzle each serving with whiskey sauce. Doubles great. Cook's Notes: Some people scoff at the use of fruit cocktail in my recipe, but I say don't knock it till you've tried it. If you are really against it, use this recipe, omit the fruit cocktail and increase the eggs to 3, the butter to a half stick (1/4 cup), and the milk and half and half to 1-1/2 cups of each. That should do it. May substitute a wide variety of leftover breads, rolls, buns, or a combination of them. You’ll need about 4 or 5 cups of rough cut, or cubed bread. 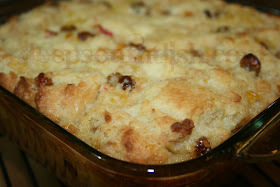 Bread Pudding French Toast: Prepare bread pudding as above, except using a large loaf pan. Let cool, then refrigerate overnight. Cut into 1/2 inch slices and place slices in a rimmed baking sheet or pan. Beat together 4 eggs with 1 cup milk; pour over slices and sprinkle with a cinnamon sugar mixture. Turn slices and sprinkle other side. Let rest for 15 minutes. Heat 1 tablespoon butter in a large skillet and pan fry slices in batches until browned on both sides, adding additional butter as needed per batch. Add a pat of butter and sprinkle with sifted powdered sugar before serving, if desired. Offer hot syrup at the table. This looks heavenly delicious!! I could cozy up to a huge bowl right about now! YUM! This makes me want to try Bread Pudding now! Doesn't that look good?! Mmmmm. Have to make it. YUM, though I have never had breading pudding. It looks so good. I so want to visit LA one day and eat all kinds of Souther Good food. People scare me about Burbon street and how dirty it is and I get creeped by that, but I'll get there one day. Maybe soon!! Especially after seeing this picture! Angel Food Ministries wants to remind everyone that the deadline for ordering is Monday, Sept 14th, 2009. Get your orders in before the deadline. Also don't forget the coupon codes. "10FALLSP1" gives 10% off the Special box #1 of Angel Food. "SeptSig5" gives 5% off a signature box of Angel Food. I'm drooling all over myself just reading this, Mary! Love, love, love bread pudding, except without the raisens (sorry)! Bread pudding with whiskey sauce is one of my very, very, very favorite desserts. Looks just perfect, this is one of my favorite desserts! Oh, so good. Great with rum sauce too. Actually it would probably be good with any kind of sauce! I think you have found heaven! OMG! I love bread pudding! I'm kind of scared to print the recipe cuz then I'll want to make it all the time! LOL! Mmm...add my yum to the list! Hi Mary...just wanted to say I am so happy to stumble upon your Blog! I am a New Orleans Girl born and raised. So look forward to making some of your yummy recipes! Welcome! I'll bet you could teach me a thing or two in truth!! Hi M! So glad that you enjoyed the recipe & hope that you come back to visit now to try a few more things! I love chocolate syrup pourded over my bread pudding. Not a thing wrong with that! I want to try this recipe, but my family and I only eat wheat bread. So I was wondering if i can use wheat bread to make this recipe? I would love to try this recipe, but my family and I only eat wheat bread. does it make a difference if you use wheat instead of white? Hi Helen! French bread is traditional but any bread will work. It's not quite the same, but still delish. Enjoy! Hello Mary Thanks for sharing this looks and sounds soooo good! I tried a bread pudding recipe that I got from somewhere I can't remember and it was so dry and tasteless.. this one sounds great and pooh pooh to the ones that don't like the idea of fruit cocktail ..like you said try it first! lol That's what I'm going to do and I know it will be good! Have to try the whiskey sauce too !!! I used a vanilla or Banana cooked pudding over top hot but on my other recipe was all too bland like I said.. i know yours won't be.. I'm clicking you on follow! thanks for sharing again.. Dena Western Canada .. and I've been to New Orleans!!! Love it our dtr from Vancouver BC got married there in 2007 now I'm going to look at your begneits recipe!! Can't wait! Sounds really good. I am going to try this. It really is - I hope that you enjoy it!! Overall the recipe looks really good. I think it unique to add fruit cocotail and really my only flinch with that is the grapes in the mixture. They were my least favorite fruit in the can. Instead of picking them out, I would just use a can of peaches. My favorite cocktail fruit. It would be a more identifiable peach flavor I'd think, sort of like peach cobbler, but it certainly would work! The fruit cocktail is a bit more neutral, and you could certainly pluck out those grapes too. I don't generally find all that many in the mix. Hope that you enjoy the bread pudding & please let us know how the peach substitution works out! All I can say is OMG.....As I was searching your blog looking for something delish to make for dinner my meat and potatoes guy was sitting here and as I came across your bread pudding recipe, and after 15 years together I was in total shock as he told me that he absolutely loved the stuff (other than an occasional bowl of ice cream he never eats sweets). I myself had never tried bread pudding before and I am so lucky that it was yours that I tried for the first time!!! Needless to say he has ask that I make another dish of it. I used the whiskey sauce on the first one and will use again...I love to cook and I just want to say thank you for sharing your recipes with us. You're so welcome Kathy! I'm glad he enjoyed it & thanks so much for taking the time to come back and let me know! You are soooo intent on making me puffier than I am already, aren't you? LOL In the last few days, you have posted several delicious (I've tried) and tempting (planning to try) recipes! I have pinned them as well! Puffy people are nicer anyway, right? :) J/K... thanks so much for the pins - I appreciate it! i really just like a little vanilla sauce with mine. I made this a couple of days ago. I added a dash of allspice and cinnamon. I used milk and evaporated milk.The texture was excellent. I cooked it a little longer because I used an 8x8pan instead of 9. It was so easy and absolutely delicious and moist. Perfect recipe. Just good ole country cooking! Holy Moly Mary this is the absolute best bread pudding ever! Who would have thought that adding crushed fruit would put this recipe in moistness heaven! No one ever knew there was fruit in it, and one naysayer swore she hates fruit anywhere, as she was eating her 3rd, yes I said 3rd portion!! Ha! So far I have made over 30 of your recipes , and can say honestly I have not tweaked even one. They are just that good !Thank you for sharing all this deliciousness!!! My granny used to make chocolate bread puddin out of her leftover homemade buttermilk biscuits that she rolled out with her hands. It was always so good but no one in our family remembers how she made it or can find the recipe. She has past on now and I guess it has gone with her . There are quite a few ways to make that kind of bread pudding - have you tried any of them yet? I made this dish exactly as the recipe stated, and it was delicious!!! Will try it with the Whiskey sauce next time, and the Fruit cocktail takes center stage in this dish. Great recipe! I'm so glad that you enjoyed it Sheila! This must be a stupid question because no one else has asked it, but I'm going to ask because I really want to make this bread pudding. You say to pulse the fruit. I don't see fruit in the ingredients. I thought you meant the fruit in the fruit cocktail, but you later say to add the fruit cocktail. Is it the fruit in the fruit cocktail you're referring to or did I miss something. Hi Mary! Never any stupid questions around here. The references to fruit and fruit cocktail are one and the same. Fruit cocktail typically contains peaches, pears, grapes, pineapple, and cherries, so when I say pulse the fruit that's what I am referring to - the drained fruit from the fruit cocktail. Mary, I was shown how to make this when I was a little girl. We used stale bread, left over breakfast oatmeal, any stale sweet buns, cake...etc. Then we added vanilla extract or coconut extract, a can of crushed pineapple, milk or cream or custard...we didn't measure it just looked and adjusted it to what looked right. we added two or more beaten eggs depending on how much we had in the bowl. I bake mine in a shallow glass dish and cut into squares. My boys and husband love it. I store the container in the fridge because it's so moist. My mum said it was ...Good old poor peoples food. Her father died at the beginning of the Depression and her mother had five children to feed. She was a beautiful dressmaker and quilter. She made a tight living for them doing that. Women in those days were very creative & resilient. Even my own Mama made do with much less to care for a family of 5. It still amazes me! the very 1st time I had bread pudding was with fruit cocktail in it, and I still love it that way!! I'm so glad y'all enjoyed it Tamara & thanks for letting me know!! There's no option on this platform for sharing pics but if you're on Facebook you are welcome to share pictures there anytime! We have always used crushed pineapple with raisins in instead of fruit cocktail and light brown sugar. Yes, pineapple is also very good though it will tend to give the bread pudding that flavor. I like using the fruit cocktail because it gives the moisture, but is a bit more neutral in flavor than other fruits. Last night at Church, I had bread pudding made from cooked biscuits and Krispy Kream doughnuts instead of bread. It was so good I felt obligated to have 2 servings. That is an especially decadent form of bread pudding but how could it not be delicious. I think I'd have to have two myself! This is/was my Gramma Salisbury's (1869-1942) reicepie that she grew up on in Canada, made by her mother from England. My mother made it, I've made from heart by watching & remembering what she put in it during the early 1940's and 50's. There are no measurements, just wing it. Rip up a loaf of THE BEST whole wheat bread you can buy (or make), 4 eggs, some melted butter, whole milk, HONEY, (no sugar) vanilla, 1 or 2 chopped up apples, cinnamon, little nutmeg, pinch salt. Beat up all the liquids, pour over ripped bread , let soak 20 min. or so, Pour into a good sized baking vessel, bake 40-60 minutes, 350 oven, or until a knife inserted comes out clean, To gild the lilly, if you want, saute up nuts & add those to the mixture. Serve it with a cornstarch, water, vanilla sauce, add butter. some Honey, a shake of cinnamon, small squirt of lemon juice, boil till thick, let cool, If you want, boil up as many golden raisins as you like, this makes it really flavorful. Sorry I can't give exact measurements, I've making this since I was 16, and I'm 82 now. But if you're a decent cook you'll know what to do do.. Don't peal the apples. Enjoy, because it's a wee bit different. Sounds delicious, especially for the fall. Thanks for sharing it with us! Thank you for sharing this recipe. I have been looking for a bread pudding recipe like the one my dear friend made. She passed away before giving me her recipe. The only difference is that she didn't use fruit cocktail in hers. I'll have to try this. Am looking forward to trying other recipes and will be looking for your cookbook. Thank you so much Ann! Let me know if you try it!! Can you mix this up the night before, and bake it the next day? I never have, but I know some folks have done that with bread pudding. Really you only need a short soak though, depending on the size dish 10 to 30 minutes max, so an overnight soak would definitely have a much more dramatic effect on the bread, basically disintegrating it really. Not that it'd be a bad thing, I just don't know since I've not done this recipe that way, so I can't attest to the resulting texture with that long of a soak. So sorry I can't help more! Hi Mary, I made your bread pudding. I doubled it so there would be plenty. I even put the fruit cocktail in it, and everybody loved it!!!! It made a 13/9 pan full. I will make this again. Awesome!! I'm so glad to hear that it was well received. There's just something about bread pudding that's so comforting. Thanks so much for taking the time to come back by and let me know everybody enjoyed it. That really means a lot to me! Hello Mary, I discovered your site quite by accident when I was searching for the Theory of General Relativity. I know, go figure. Southern cooking reminded me of a dish my grandmother would make us kids. Grandma wasn't from the South, but she must have picked up this recipe from someone on a wagon train from St. Louis to California. Her recipe and yours seemed so close. Glad I found it. As an aside: When we kids were in an "anxious state" grandma would make this great dish. Depending upon how anxious we were depended upon how much Bourbon she put into the hot sauce. If the first serving didn't calm us down enough, she asked if we would like another. Grandma was a sly one. Of course we said yes, and she would pour a little more sauce over the pudding. Wasn't much later we were a ready for bed. Grandma finally had some peace and quiet. Amazing how a recipe can conjure up a memory from nearly 70 years ago! Thanks for the recipe. It was great! You're very welcome - gotta love those grandmas! On the other hand, I'm sitting here scratching my head about how you got here from that search, but doesn't matter really. I'm glad you found your way here and hope you find a few more recipes here and there to try. Welcome! I want to post on Facebook for my daughter and I don't know how. Hi Leetta! There are several ways to share to Facebook. At the top of the recipe you'll see the Facebook blue button icon. Click on that. At the bottom of the post, where it says "YOU MAY ALSO LIKE" with the photos, there's a share button. Click on that and it will give you a Facebook option. 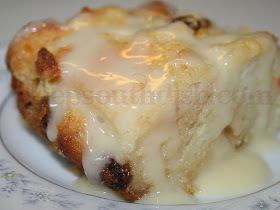 You can also copy and paste this link on your Facebook page: http://www.deepsouthdish.com/2009/09/old-fashioned-southern-bread-pudding.html Hope that helps! Hi Mary! I made bread pudding for the first time using the recipe above. My mother use to make it when I was a child and I have never tasted anything close to her recipe. This recipe hit the mark. I prepared a batch to take into work and the crew loved it as well. The fruit cocktail was a real surprise and I substituted rum for the whiskey sauce. Awesome! I chose Trader Joe’s Brioche, and didn’t add fruit cocktail. Instead of raisins, dried cherries which paired well with our favorite, Maker’s Mark, bourbon in Whiskey Sauce. It was excellent. Thank you for sharing!